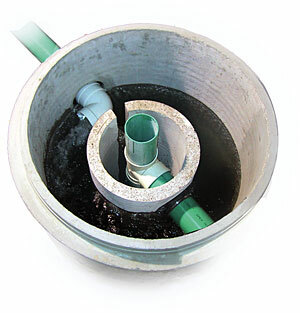 The ecoStorm™ is a technology intended for the separation of floating pollutants, litter and contaminated settling solids from stormwater drainage. ecoStorm™ consists of 2 circular concentric precast structures: An outer structure forms the swirl-chamber/vortex separator, the inner cylinder serves as a floatables collection chamber and outlet chamber. Swirl-chamber technology combined with vortex design principles, effectively treat the stormwater by removing and retaining sediments and floatables from site runoff. Click here to download the ecoStorm™ product brochure in pdf format. With increasing urbanization, the problems of stormwater runoff from impermeable surfaces are becoming more apparent. The key to successful stormwater treatment is the removal of sediments from stormwater-run-off contaminated by heavy metals, hydrocarbons and their floating residuals from paved, impervious sites. Chemical pollutants and heavy metals tend to be associated with the finer particles in stormwater sediments, therefore it is essential to contain these polluted sediments within any removal device. ecoStorm™ is our answer to a affordable hence effective management of non-point source pollutants. ecoStorm™ has also been designed for gross particulate removal upstream of constructed ponds, therefore extending the frequency interval for required pond maintenance. For the treatment of point source runoff (interior discharge from floor drains of maintenance facilities) and non-point source stormwater runoff from industrial areas (gas stations and other fueling facilities, ...), the ecoSep oil water separator is the right technology for achieving the most current and an investment towards even tighter removal efficiency requirements for future stormwater discharge permits.